As an Indian, living in India and someone who has easy access to the best of Indian food cooked both at home, in the homes of foodie friends and relatives (all of whom keep excellent tables, by the way) and in restaurants and street eateries, I must admit I have a slight bias against any “easy Indian” recipes, many of which are inauthentic, inaccurate and bastardized versions of what you would really eat in India or in Indian homes. But once I flipped through the pages of Manju’s book, all my doubts were laid to rest. Yes, she does give you recipes such as “Madras curry paste”, which I am unable to fathom and figure out—what is it a base for? Non veg cooking? But that doesn’t quite exist in Tam Bram (Tamilian Brahmin) homes in Madras, or Chennai as it is now called. Sambhar, the spicy lentil preparation of the region? Veggies? Or all of the above? But such minor irritants aside, I think the recipes are wonderful in the simplicity and do-ableness and suitable particularly for a beginner or some one like me who frequently complains of a lack of time to fit in cooking in her kitchen into the daily schedule. From starters like onion pakoras, fritters, a street snack particularly in Maharashtra (to which state Manju partly belongs; which explains why she has so many Maharashtrian recipes in her earlier books as well), to Amrtisari deep fried fish with its wonderful flavours of cumin and ajowan spice, Manju includes all the popular snacks, desserts and main course dishes as well as side orders like rice variations and a variety of Indian breads in this collection. She describes the spices and the ingredients for the benefit of first time cooks and adapts cooking techniques for the modern home; for instance, she tells you how to do a chicken tikka on the grill or BBQ instead of using a clay tandoor that is traditionally set up outside in Indian restaurants (or villages). That’s one excellent and simple recipe that I am waiting to try out. 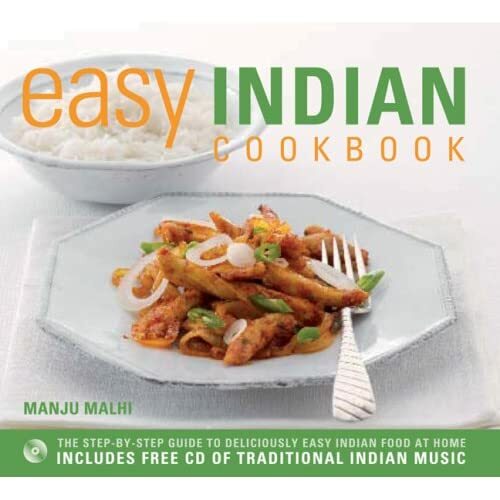 The DIY practicality is enhanced in a separate section that gives you complete menus – starters to dessert – that you may find useful in case you are planning “an Indian” for the first time. Another plus is that the ingredients used are easy to find on supermarket shelves in the UK or US. For instance, haddock is used in the Amritsari fish preparation instead of the Indian Bekti fish. Finally, the vegetarians can rejoice. Indian cuisine has a vast repertoire of vegetarian recipes but many cookbooks overlook this. Manju’s collection doesn’t. Melt butter in a large saucepan over medium heat. Add ginger, garlic, onions and chillies, frying frequently for 2 minutes. Tip the cumin, salt, turmeric and coriander into the pan, followed by spinach. Fry for 15 minutes until potatoes are tender. You can buy Manju’s book on Amazon for $ 18.21 only.